A couple of months ago AT&T and Verizon started blocking all tethering apps from the Android Market but Sprint remained being the ‘good guy’ and didn’t blocked tethering apps like AT&T and Verizon did. Now that over. 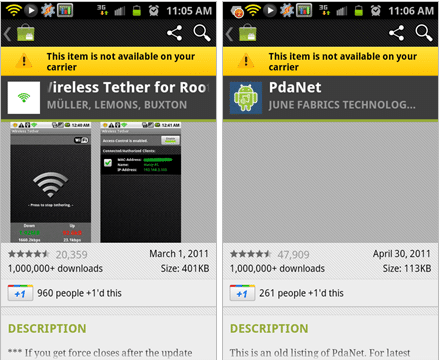 Sprint has apparently has begun blocking tethering apps too and making them not ‘available’. This was done in order to relieve network congestion. Don’t worry, even though Sprint blocked those apps from being download from the Android Market, you can still sideload any tethering app from developers website and download and install it normally.